Square Enix's recent unveiling of the Seiken Densetsu Collection for Switch (due out in Japan on June 1) prompted me to think about a few games I haven't pondered in years. Actually, I mostly thought about Seiken Densetsu 2, known as Secret of Mana in the West. 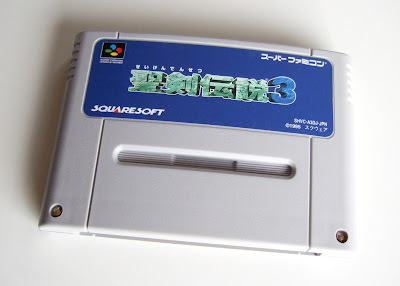 That's because I've never played the third Seiken Densetsu game, although I was keenly aware of and interested it in the run-up to its Japanese release. 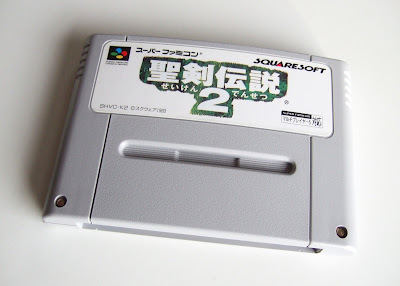 Anyway, back to Seiken Densetsu 2, I remember when it first started appearing in North American game magazines like Electronic Gaming Monthly and DieHard GameFan, which often referred to it as Final Fantasy Adventure 2. 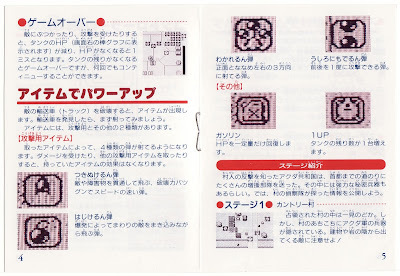 I loved everything about it from the word go--the colorful backdrops, the surprisingly large (for the time) character and enemy sprites, the plethora of useable weapons and the real-time combat. I'm pretty sure my brother and I obtained this game as soon as we were able, which likely meant I received it as a birthday gift or we got it for Christmas. Regardless, we spent a lot of time playing through it together shortly after it hit store shelves in our neck of the woods. Is there any chance I'll finish Secret of Mana--or Seiken Densetsu 2--if I pick up a copy of the Seiken Densetsu Collection for Switch? (You can pre-order it via amiami.com, by the way.) I kind of doubt it, but who knows? Far more likely would be for me to finish the first Seiken Densetsu--renamed Final Fantasy Adventure when it was brought to North America--or even Seiken Densetsu 3. 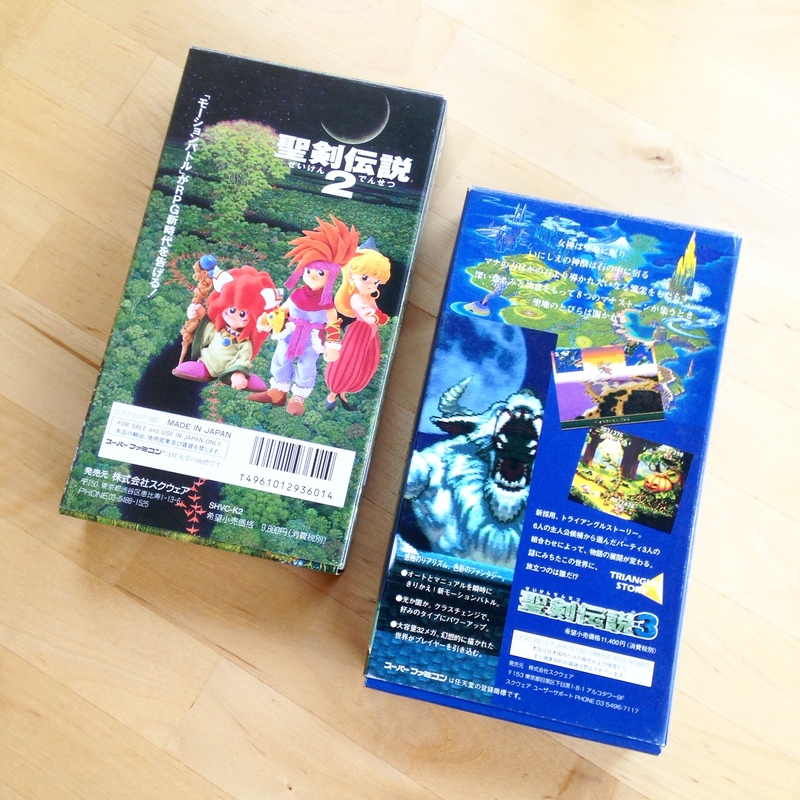 Speaking of the original Seiken Densetsu, here's a post I wrote and published about its beautiful packaging (outer box, cartridge and manual) a while back. Of course, this post is supposed to be about the beautiful packaging the folks at Square Enix--Squaresoft back then, actually--produced for Seiken Densetsu 2 and 3, so maybe I should start talking about that. On that note, I think the photos included throughout this write-up are pretty self-explanatory, don't you think? 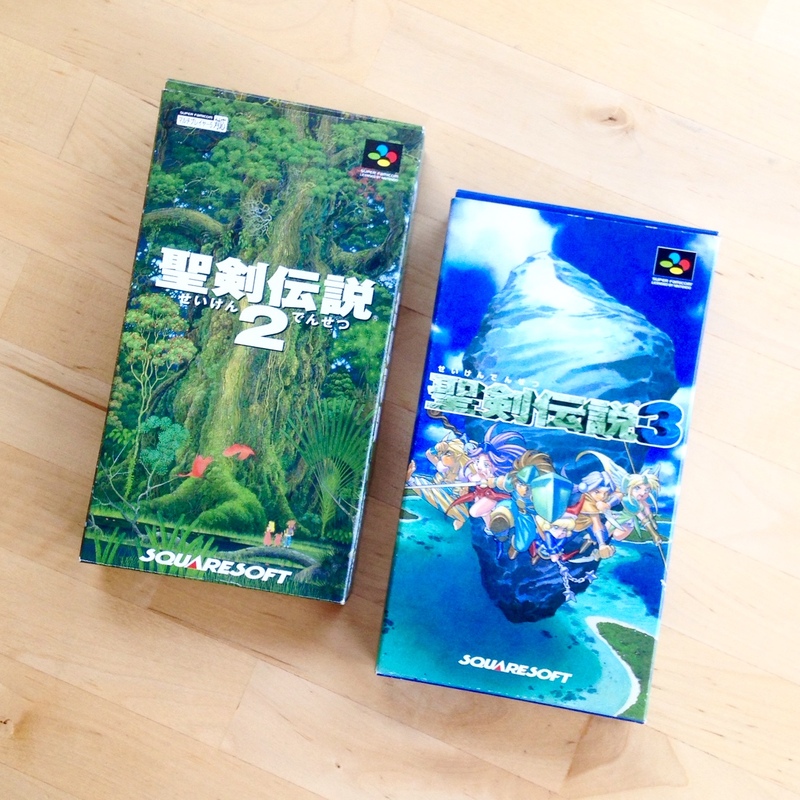 One comment I'd like to add: Seiken Densetsu 2's box art (see top photo) is one of my all-time favorites. 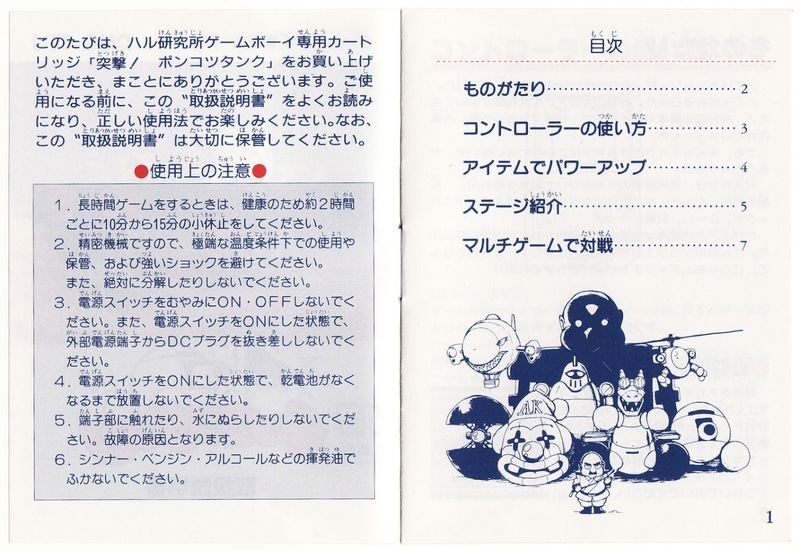 Also, the clay models of that game's main characters, which can be seen in the snapshot of its instruction booklet, have always brought a smile to my face. 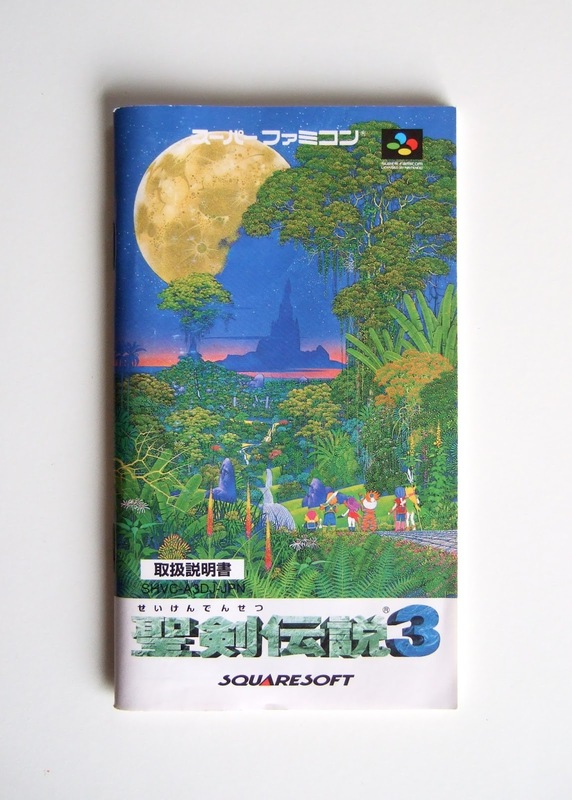 Seiken Densetsu 3's manual is pretty awesome, too--its cover, especially. 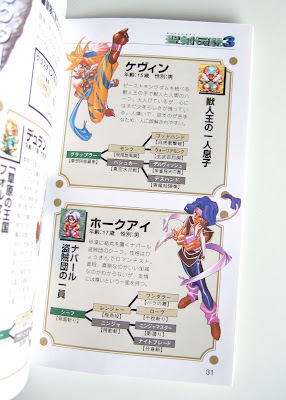 What do you think of the boxes, cartridges and manuals made for Seiken Densetsu 2 and 3? And what do you think of the games themselves, if you've played them? I knew going in that Totsugeki! 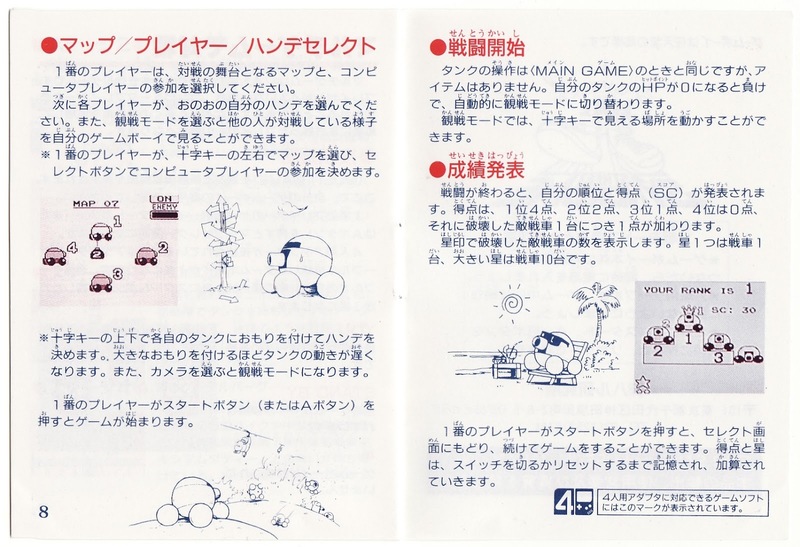 Ponkotsu Tank's instruction manual would have a hard time topping its delightfully colorful cover art. 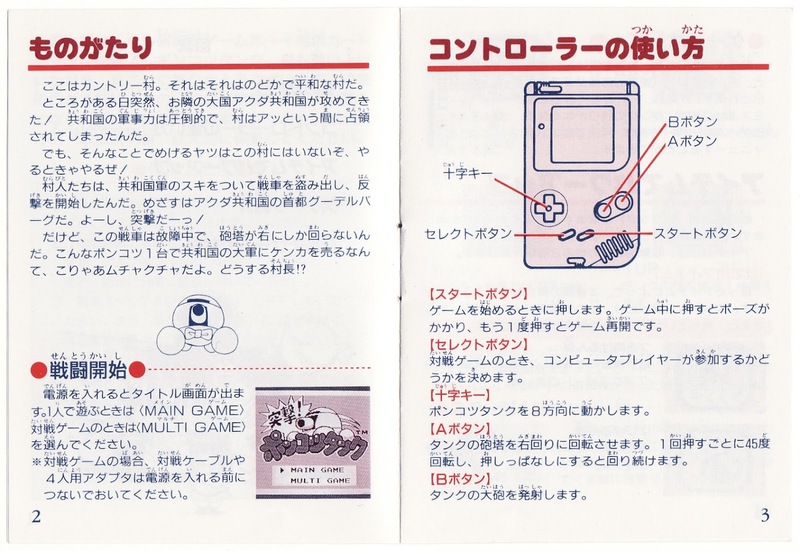 Did that slight lowering of expectations prompt me to like this Japanese GameBoy game's manual more than I would have otherwise? Perhaps. I'm pretty sure I would have come around to loving it eventually, though, given the number of cute illustrations that are tucked inside of it. Before we get to those, let's focus our attention on this manual's cover. Its three-tone aesthetic is nice, don't you think? I also like that it offers up an expanded view of the art that graces the front side of Totsugeki! Ponkotsu Tank's outer box. 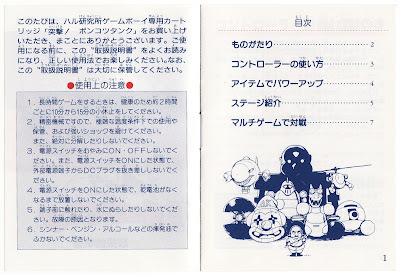 As for the cute illustrations I mentioned earlier, one example (the best of the bunch, really) can be seen in the above. I don't know about you, but that clown tank (at least I think it's supposed to be a tank) on the left reminds me of Tumblepop's Japanese cover art. Another adorable drawing appears on the second page of Totsugeki! 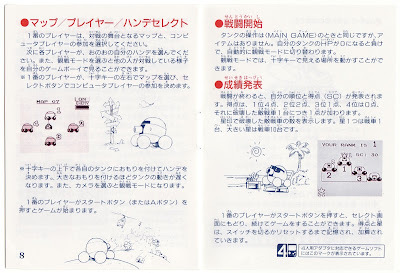 Ponkotsu Tank's instruction booklet. Though small, it depicts the titular vehicle wearing a bow tie. That would surprise me--if I didn't know the folks at HAL Laboratory made this GameBoy title. Don't take Totsugeki! Ponkotsu Tank's brevity as a sign that it or its North American counterpart (published here by now-defunct Electro Brain), Trax, should be avoided. On the contrary, its snappy gameplay more than makes up for its lack of stages--or at least that's my personal opinion on the matter. Do its outer box and instruction booklet also make up for this game's lack of content? I'd say so, but I'd also say it depends on how much you have to pay to obtain them (by buying a complete copy). Have any of you played Trax or Totsugeki! Ponkotsu Tank? If so, what do you think of the game? And what do you think of its Japanese manual? See also: previous 'Manual Stimulation' posts about Bubble Bobble Junior, BurgerTime Deluxe, Ghostbusters 2 and Snow Bros. Jr.
With that out of the way, here are five additional PC Engine games I think deserve a lot more attention than they currently receive. Dragon Egg!--Before I get to why you should play this NCS-published HuCard, please understand it's probably the "worst" of the five games discussed in this post. It's also likely to provide the most limited thrills--thanks to the fact it can be breezed through in an hour or less if you're properly skilled. Still, I've had a soft spot for it ever since I first played it a few years ago. Why? 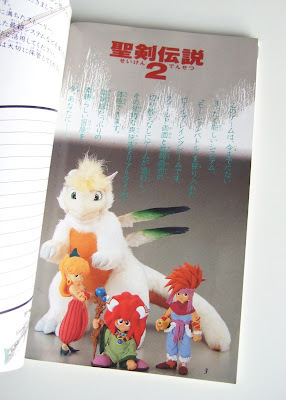 Its female protagonist and her dragon companion (who doubles as both a weapon and a form of transportation, depending on how much he's powered up) are the main reasons, although its "early Mega Drive" graphics and gameplay aren't far behind. Final Match Tennis--It probably seems strange that I would include a tennis game here. And, really, if you loathe the sport this HuCard depicts (in an arcade-y way), you're unlikely to get much enjoyment from it. 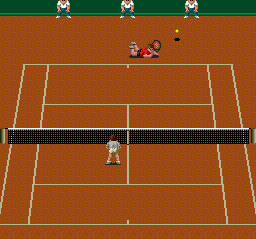 Everyone else, though, should give Final Match Tennis a chance. It's easily one of the most accessible--not to mention fun--tennis games around, in my opinion, with only Super Tennis for the SNES (Super Tennis World Circuit for the Super Famicom) topping it. One area where this Human Entertainment-made card bests that TOSE-made cart: its snappier gameplay, which helps keep points, games and matches from becoming boring. 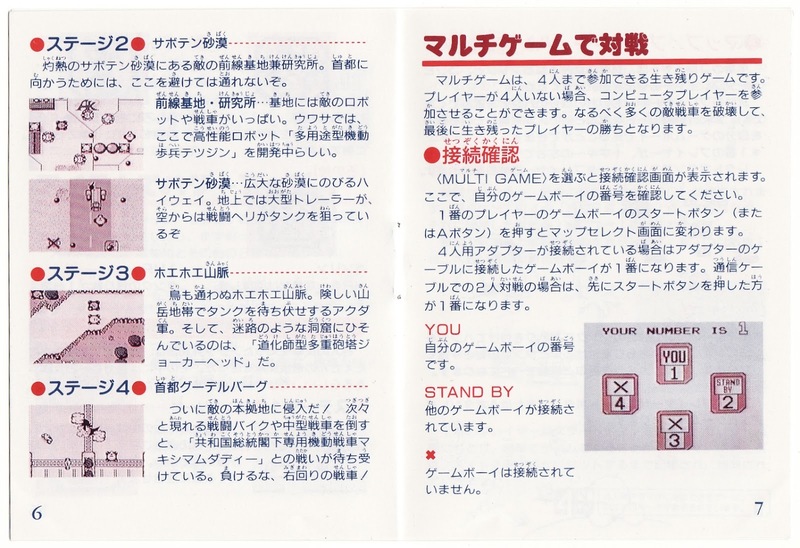 Genji Tsushin Agedama--At first glance, Genji Tsushin Agedama appears to be your standard 16-bit side-scroller. That assessment goes out the window as soon as you advance past the game's title screen. To begin with, almost all of its stages are of the auto-scrolling sort. 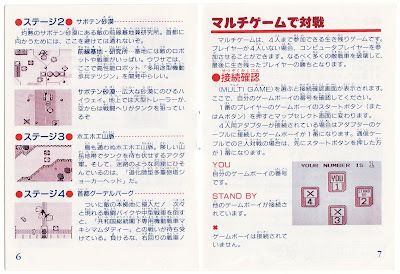 Also, its power-up system is more like something you'd experience in a shoot 'em up (think Gradius or R-Type). 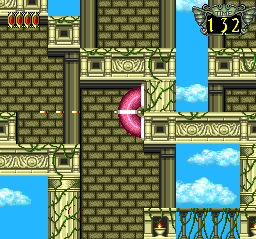 Add to this backdrops that are as bright and colorful as can be plus some nicely drawn and animated enemy sprites, and you've got a PC Engine title that should have a far higher profile than does right now. Makai Prince Dorabocchan--I turned up my nose for a long time at this platformer because I assumed it was nothing more than a poor man's version of Konami's Akumajō Special: Boku Dracula-kun. And, in a way, that's basically what it is. That doesn't mean it's a stinker that should be avoided like rabid skunk, though. It's not as graphically appealing as the aforementioned Famicom (and GameBoy) title, but it makes up for its comparably basic visuals with stages that provide players with an ample number of surprises and boss battles that are fun as they are thrilling. 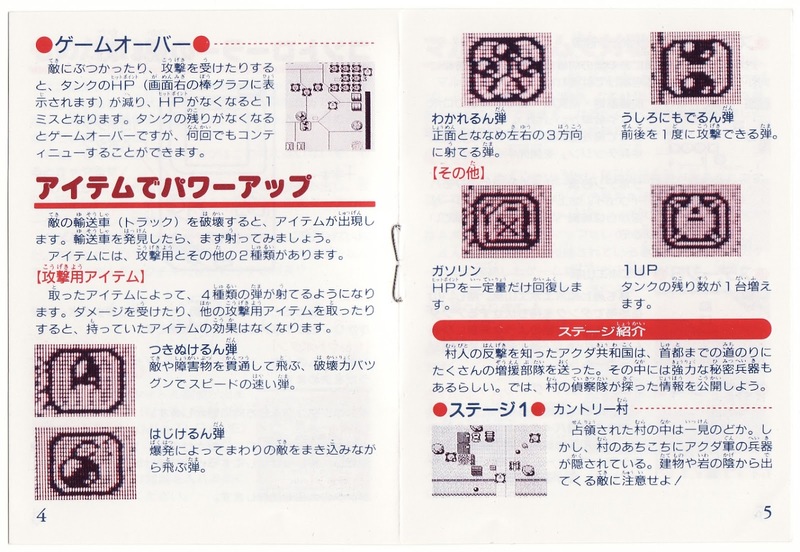 Mesopotamia--Of all the PC Engine games highlighted here, Mesopotamia likely is the least ignored of the bunch. That's because Atlus both developed and published it (in North America, it's name was changed to Somer Assault). 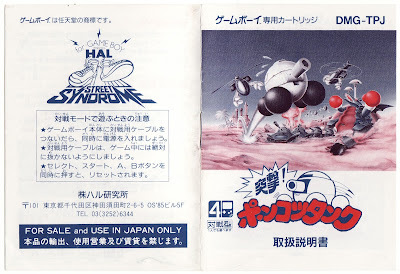 Also, this HuCard is as wacky as any to be made for NEC's Japan-conquering console thanks to its odd protagonist (if it can be called such a thing), which looks like a pink Slinky that can shoot bullets. To make your way through its many maze-like environments, you crawl end-over-end along their walls, floors and ceilings. One bummer: enjoying the scenery isn't an option due to the unfriendly (meaning tight) time limit that's imposed on each and every stage.